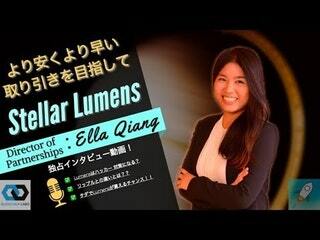 In an interview with Blockchain Asset Review, Ella Qiang, director of partnerships at Lightyear.io (a software company for the Stellar ecosystem), discusses Stellar’s ambitious to create a global payments network. BAR: How do you compete with Ripple? EQ: I think commercially we have taken a different route because they’re busy targeting the interbank settlement. And there are in competition with Swift. We are focused on the money transfer operators like the Western Union and MoneyGram and other smaller money transfer enterprises. More recently, we even focused on telecom companies that operate mobile wallets in the emerging markets. MoneyGram and Western Union are the two biggest players. But you have UAE Exchange, TransferWise and even they can be our clients. But what do you want is to give smaller players in the remittance sector known as money transfer operators (MTOs) with the technical advantage to compete with the likes of Western Union and MoneyGram. For Stellar, we have a variety of different partners and big clients such as IBM. We have about 10 to 15 companies testing among each other on the live network. We have a large number of clients in the process of integrating to be part of the Stellar stack. BAR: So stellar is a public chain and how different it is from Ripple? EQ: Ripple is a for-profit Foundation and is also a software provider. Stellar is an open protocol platform so anyone can join it. BAR: Please explain me how will Stellar help if you are, say, a money transfer operator in India? EQ: The problem that most MTOs are facing are that they have to do technical integration with different companies so each of these companies have to manage like 100 different APIs (application programming interfaces). But once you have done the integration with Stellar, then you don’t have to do anything with others because they are also on the Stellar network and they’re all sharing the same system. BAR: And then there is the on-chain real-time settlement that helps resolve the issue of prefunding? EQ: Anyone can do on-chain real-time settlement. Without stellar, all the MTOs have to prefund the amount. Because I’m doing the pay-out for you so you have to first deposit fund with me. You will have to put money in all these different countries and this money is not being used. This is a huge operational burden for treasury and not a very good use of capital. BAR: How does it manage to do that? EQ: With Stellar what it does is that it can support with the liquidity available on the network. Stellar has a built-in decentralized exchange so you have different order books like foreign exchange traders who want to buy and sell cryptocurrencies with the local currencies. You are basically taking liquidity from the platform without prefunding so you do that by using bridge currency like Lumen. BAR: Do you have to use Lumen, Stellar’s native currency, for that? EQ: No, you don’t necessarily have to use Lumen but in a lot of cases it is the most efficient currency on the Stellar network. BAR: Are there are any regulatory challenges? EQ: All these MTOs we are working with are already regulated and licensed in their own jurisdictions. Stellar is just the technology powering it. It doesn’t really matter whether you are using Lumen as an intermediary currency, because you would still need to do know-your-customer and anti-money laundering checks. BAR: I heard the Basel III capital requirements have played into the hands of companies like Ripple and Stellar? It has led to a withdrawal of correspondent banking along certain remittance corridors and regions, especially in the emerging markets? EQ: It is part of what you call fractional reserves. They were counted as part of reserves but not anymore after Basel III went into force. The incentive to park cash would be a lot less because they’re not counted as reserves anymore. BAR: How effective cryptocurrencies are as payment methods in general? EQ: In fact, a lot of the cryptocurrencies are used for different purposes to power their specific platforms and their specific purposes. As for them becoming real payment currencies, I don’t think that’s going to happen anytime soon. I don’t think Lumen will become a payment currency in the short term. It is a medium to power the Stellar network and it’s a great asset to facilitate cross-asset payments. BAR: Can people issue digital currencies on the Stellar network? EQ: Anyone can issue digital assets on the Stellar network. I can also issue my own digital currency backed by say Singapore dollar on the Stellar network and DBS Bank can issue one as well. But they would be priced slightly differently because even though they have the same underlying asset there is a difference in the credibility of the issuing entity. Still, anyone can issue a tokenized version of anything on Stellar. BAR: How can you resolve solve the issue of scaling? EQ: Currently, we are able to do 1000 transactions per second. But we are also planning to implement Lightning Network by the end of this year. It would significantly change the throughput though I do not have specific figures yet. It is a lot faster on centralized systems. For instance, Alipay, on a peak day, is able to handle 250000 transactions per second. Some permissioned platforms can do million transactions. But, of course, you can do that if you are running only three nodes. BAR: For a public chain, you do not use proof-of-work as a consensus mechanism? EQ: As to our consensus mechanism, we do not need to mine cryptocurrencies because it is not based on proof-of-work or proof-of-stake. Since we don’t mine Lumen, we are more scalable than others. The consensus mechanism that permissioned chain like Corda use is known as byzantine-fault-tolerance (BFT). We use a federated version of BFT. There will be centralised organisations or entities who would decide who are going to be the validators of this network. Since we are a public chain, that’s why we call it federated. Anyone can be a validator but I choose who is going to be validating my transactions. You have all these different circles and small networks. So, it is a hybrid-model. BAR: How are banks warming up to these technologies? EQ: Banks are still more comfortable with the environment of permissioned chain. But there has been a slight shift in attitude since last year. But they’re willing to learn more about public chain especially when it comes to settlements. You would need tokens for settlements. If it is a permissioned chain without a token then it’s just information. BAR: What is Stellar’s end game? EQ: What we’re trying to do is to create a network for a global payment infrastructure. It doesn’t make sense if it is a form of closed environment. Because there are so many different systems and there are so many different assets. It makes sense for us to have this open source network that anyone can participate. But for companies such as Lightyear.io, we want to build a business model around it. You can build something on the top of the permissionless chain. BAR: Do you think you really need blockchain for domestic payments? EQ: However, Stellar is one example of cross-border payments but I think probably a centralised environment would work better if it is for domestic payments. It doesn’t make sense to use blockchain if there is already an efficient domestic fast payment network. Any type of cross asset transaction, including fiat to fiat or to fiat to exotic to fiat currency to another exotic currency. It is a platform where anyone can you issue tokens backed by real world assets: bonds, real estate and private equity. BAR: Private equity funds? How are they using Stellar? EQ: They want more liquidity. They want to attract more investors and lower the barrier to capital-raising and reach out to more countries. It’s still at an early stage but there are some companies who are already doing it. I am sure there’s going to be some regulatory issues because there are no legal frameworks yet. So, you have to face it, and then work with the regulators if there are no legal frameworks to start with. BAR: Which jurisdictions are important for you in terms of regulations? I heard G20’s position would be quite key? EQ: I think G20 is quite symbolic but, in the end, I think it is going to be country by country. it’s going to be quite interesting to see what’s going to happen in India because India is the largest country in terms of payments, at least in cross-border remittance. It is an important market for us.